Built-in GPS. 4GB of music storage. Android notifications. And a pretty curved display. The Gear Fit2 packs a lot of razzle-dazzle for $179. Android Wear vs. Samsung Gear: Which smartwatch should you buy? 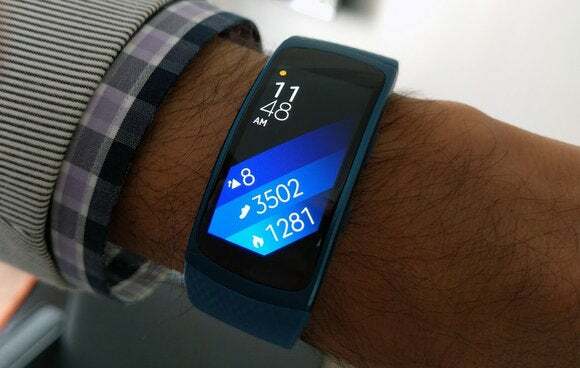 Considering how many wearables Samsung has unleashed in the last two years, you almost have to applaud the company’s patience in releasing a follow-up to its original Gear Fit activity tracker, a somewhat flawed device that received middling reviews. But here we are. On the surface, the new Gear Fit2 looks a lot like its namesake from 2014, but its feature set has been updated to 2016 standards. For $179—that’s $20 cheaper than the original’s MSRP—the Gear Fit2 gives you stand-alone GPS, 4GB of music storage, all the same notifications as your Android phone, and automatic tracking for running, cycling, sleep, and other activities. All of this (and more) is delivered in a curved, 1.5-inch Super AMOLED display that looks way more sci-fi movie prop than anything you’ll get from Apple or Fitbit. Do you want to pretend you’re a time traveler from 2050? Then this is your wristband. But there’s no denying the Gear Fit2 is visually arresting, offering screen after screen of charts and graphs that should appeal to junior data scientists. The high-tech appeal is undeniable. You can preorder the Gear Fit2 at Amazon, BestBuy.com, and Samsung.com tomorrow, or wait to buy it at retail on June 10. You can’t swap out bands, but you can have your Gear Fit2 in two different sizes, and choose from blue, pink or black. 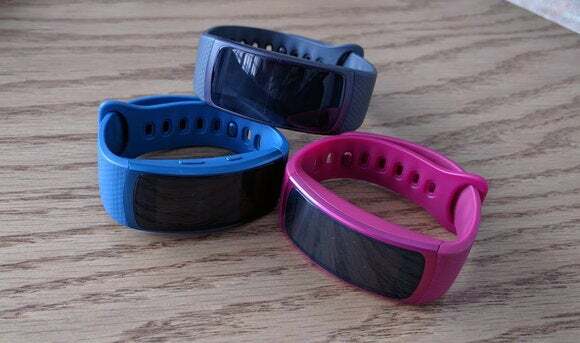 The story behind the story: Activity trackers continue to be consumer favorites despite pressure from ostensibly more useful smartwatches. 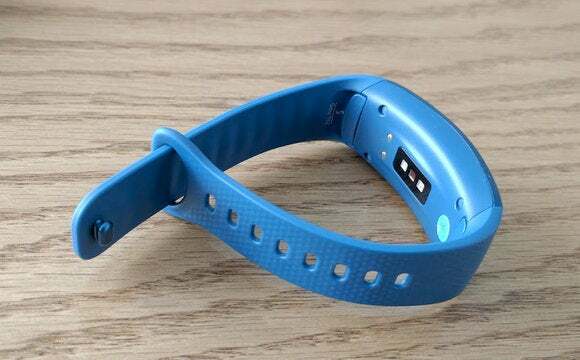 Indeed, the latest report from IDC tells us that Fitbit owned 24.5 percent of the worldwide wearables market in Q1 2016, followed by Xiaomi (19 percent), and Apple (7.5 percent). Obviously, Apple leveraged Apple Watch sales, but Fitbit and Xiaomi are all about fitness wristbands. 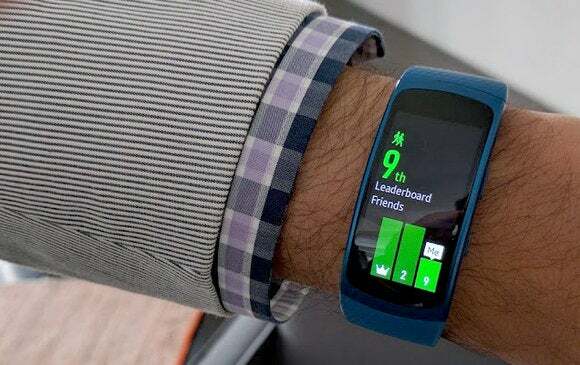 Samsung held the fifth position with 3.6 percent of the worldwide wearables market. The company’s wearables portfolio has been almost entirely focused on smartwatches like the Gear S2, so a return to affordable fitness tracking—the product category consumers care about most—only makes sense. What’s more, Samsung is doubling down on fitness wearables with the just-announced Gear IconX, a pair of wireless earbuds that do step-tracking and heart rate monitoring on their own. The Gear Fit2 may be “just” an activity tracker, but its feature set wanders into smartwatch territory. There’s a lot to cover here, so let’s dig in, feature by feature. Full Android support: The original Gear Fit would only work if you had a Samsung Galaxy phone, whereas the Fit2 is compatible with any phone running Android 4.4 and higher. Onboard GPS: With a GPS module built right in, you can see a map of your running route, as well as your running pace, all without having to take along your phone. The Gear Fit2 includes 4GB of storage for onboard music, and can display album art from Spotify. 4GB of music storage: Continuing with the “leave your phone at home” theme, the Gear Fit2 includes 4GB of storage for music tracks. Of course, you’ll need some type of Bluetooth earbuds to actually listen to anything, and that’s why Samsung is pushing the IconX. 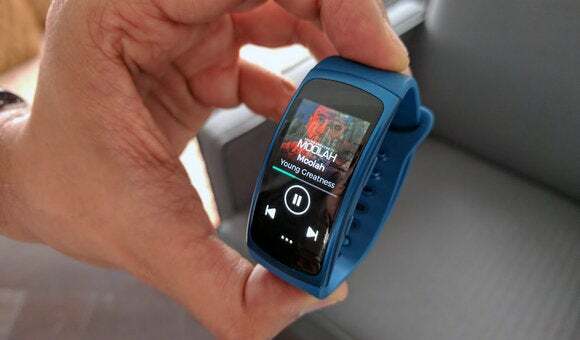 Samsung has also partnered with Spotify, giving you album art and other Spotify features directly on the Gear Fit2. Automatic exercise tracking: The Gear Fit2 can automatically sense when you’ve started running, walking, cycling, rowing, elliptical machine training, or sleeping. If you engage in any one of these activities for more than 10 minutes, the band will start logging your progress. You can also manually trigger fitness tracking for yoga, pilates, and other activities. Heart rate data: Unlike the original Gear Fit, which only supported heart rate “spot checks,” the Fit2 gets closer to real-time heart-rate tracking, polling your heart rate once every second during the heat of exercise. It also checks your heart rate once every 10 minutes to create a daily view of what’s going on with your ticker. Relative to the original Gear Fit, the Gear Fit2 seems to have an improved clasp. Note how the band now slides through a loop, aiding strap alignment. Notifications: Any notification that appears on your Android phone can appear on the Gear Fit2, just as long as the two devices are paired. You can also send preformatted quick replies and emoticons to anyone who calls or messages you. Battery life: The Gear Fit2’s 200mAh battery promises three to four days of typical use. You charge via a proprietary charging cradle. Design: The Gear Fit2’s signature design feature is a dazzling, 1.5-inch, curved Super AMOLED display. With a 216x432 resolution, pixel density hits 322 pixels per inch. You can’t swap out bands, but the device does come in small and large sizes. You also have more than one color option: black, blue and pink. With an IP68 rating, the Fit2 can be worn in the shower, and even briefly submerged in water. But don’t go swimming with it on. Gear Fit2: The wearable for people who love wrist-worn charts and graphs. I don't yet have a review unit, but I did spend about 10 minutes with the band during a product demo. I found it incredibly light, and comfortable to wear. 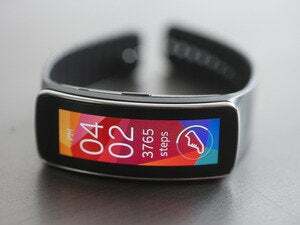 I also think Samsung’s clasping mechanism—which slides the band through a loop, aiding alignment—is an improvement over what was delivered in the Gear Fit. Will the heart rate data be accurate? Will the interface be easy to use? And what about Spotify integration and automatic exercise tracking—how does it all work? Hopefully we’ll soon get our hands on a Gear Fit2 to begin testing.